The Best Western Fallsview Hotel is located in the heart of the tourist area across the street from Niagara’s newest casino, the Fallsview Casino, and the IMAX Theatre. This AAA/CAA approved hotel is just a short walk to the majestic Falls and 1 mile away from Marineland. The Best Western is a family hotel with 243 – 100% non-smoking rooms, including jacuzzi suites, all complete with private balconies. The AAA-CAA approved Best Western Fallsview Hotel, offers its guests all the amenities and luxuries expected in a fine full service motor hotel. With prime location in the heart of the Fallsview Hotel district it’s within walking distance to the: American Falls, Canadian Falls, IMAX Theatre, People Mover System, and Skylon Tower. 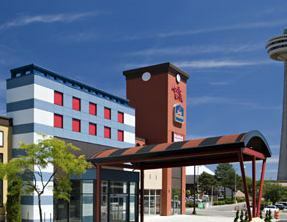 The Best Western Fallsview is directly across from the New Fallsview Casino and only 1 mile from Marineland. Double deck sightseeing tour bus departs from our lobby daily. After a long day of visiting Niagara’s sights relax in the indoor pool. Don’t forget to experience the Whirlpool or curl up by the fire in the Upper Lobby where you can order a beverage or snack before you join us at the Apollo Grille for a delicious meal. Open daily for breakfast and dinner, the Apollo Grille at the Best Western Fallsview has a menu to suit every appetite. Whether you are craving a full meal, lighter fare or specialty meal, the menu offers Heart friendly, Carb conscious or vegetarian meals.